TATA NANO the only available car below 2 lac has got its first rival.having given a tough fight to HERO HONDA in bike segment Bajaj Auto has unveiled its RE60 4-Wheeler in New Delhi. 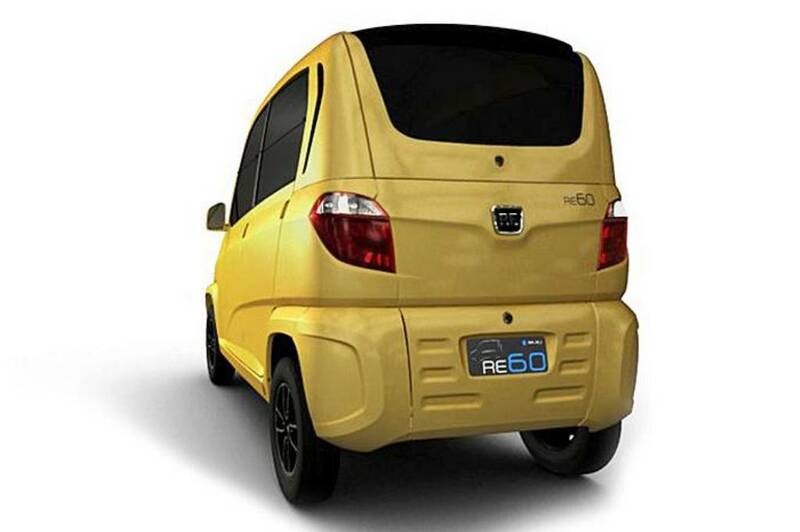 The Bajaj RE60 has the lowest CO2 emissions of 60 g/km. It is why the name RE60 has been given to this car.The company claims a mileage of 35 kmpl and the RE60 will hit a top speed of 70 kmph. The tall boy design looks funny and the RE60 is more of a 4-wheeled rickshaw than a car. The front seems to be inspired from the Fiat Uno, while the overall body looks like that of a small Maruti Suzuki WagonR. The Bajaj RE60 offers 2+2 or 1+3 seating and has the speedometer in the center of the dashboard, right above the center console. The vehicle has a single wiper and runs on 135/70/12 tyres. With a weight of just 400 kgs, the RE60 is very light and will also be offered in a CNG version. Bajaj will offer 2 variants of the RE60, a commercial variant and a private variant. The vehicle will be made at Bajaj Auto’s Aurangabad plant. Bajaj has developed an all new 200cc (some sources claimes it to 800)petrol engine to power the RE60, which is Euro IV compliant. This new petrol motor is a fuel injected (uses a close-loop fuel injection system), water cooled unit, using 4-valve and twin spark technology producing 20 BHP of power. The sequential transmission is easy to use. The mono coque metal polymer hybrid structure is light weight and results in the low weight. The length is 2752mm, the width is 1312mm, while the height is a generous 1650mm. The RE60 has 44-liter of rear boot storage, 7-liter under the hood and 400 liters with the rear seats folded down. The turning circle is very small at just 3.5 m (the Tata Nano has a turning circle of 4 m). Maruti industries who is already facing sinking market share now get another challenge in form of Bjaj RE60. Bajaj will commence sales by exporting the RE60 to Sri Lanka. Bajaj has used existing plant to save Rs. 350 crore on the RE60 project. This 4-wheeler is still open for Renault-Nissan to market as their own small car.